Congratulations Claudia Zimmer, 6th Grade Teacher at Winifred Harelson Elementary School in Amphitheater Public Schools – TVT and OfficeMax/Office Depot TEACHER EXCELLENCE AWARD winner! Claudia was nominated by parent Kim Wall, who says, “Mrs. Zimmer has a fun and friendly attitude. She engages the kids so well with energetic enthusiasm. She gives ideas on ways to improve if the student needs it. All her students adore her. As my son says, “she may be the best teacher I’ve ever had, she teaches us about life.” The award presentation was attended by her family, Amphitheater Public Schools principals and administrators, and Tucson Values Teachers board members. Mrs. Zimmer received a plaque, flowers, and $100 gift card from OfficeMax/Office Depot in a surprise presentation in front of the sixth graders. 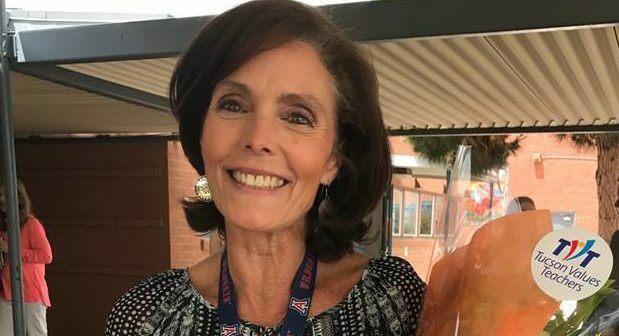 Additional Teacher Appreciation Week goodies include a bell from Ben’s Bells Project, and pizza delivered to her classroom from Humble Pie Tucson. Kudos to you, Claudia! The outpouring of affection from your students speaks volumes to the fantastic work that you do for your students every day. Keep up the excellent work, we truly appreciate all that you do for students and our community! Know an outstanding teacher who deserves to be honored with the Teacher Excellence Award? Nominate them today!